A fascination with the spirit world has drawn the attention of scholars and laymen alike for centuries, if not millennia. The draw is especially strong with prehistoric societies, since the absence of written records leaves the field of interpretation temptingly wide open. In the decades after the exciting finds from Jericho in the 1930s (e.g.,Garstang and Garstang 1948) and 1950s (Kenyon 1970) and the dramatic evidence from £atal Huyuk in the 1960s (Mellaart, 1967), a coherent picture of the realm of ritual and ceremony emerged that has found widespread acceptance (e.g., Cauvin 1972, 1994; cf. Rollefson 1983, 1986). But the recent accelerated pace of field research in the Levant, particularly in the Early Neolithic period, has produced considerable new material that requires us to reconsider the earlier views of what rituals occurred and what functions they served in the local and regional social network. Much of the latest information comes from 'Ain Ghazal, and the evidence from this site will be examined in this chapter. GARY O. ROLLEFSON • 'Ain Ghazal Research Institute, 64372 Ober-Ramstadt, Germany. Life in Neolithic Farming Communities: Social Organization, Identity, and Differentiation, edited by Ian Kuijt. Kluwer Academic/Plenum Publishers, New York, 2000. Figure 1. 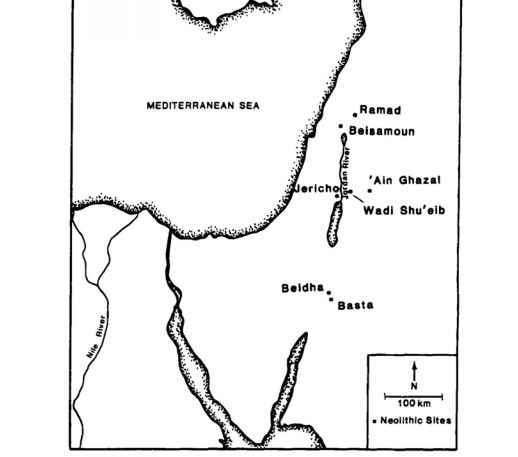 Location of'Ain Ghazal in relation to other Neolithic sites in the southern Levant. farming settlements in the Levant. Occupied continuously for more than 2,000 years, the settlement witnessed four major phases of development, including the Middle PPNB (MPPNB, 9,200-8,500bp), the Late PPNB (LPPNB, 8,500-8,000bp), the PPNC (8,000-7,500 bp), and the Yarmukian Pottery Neolithic (7,500-?6,500bp). The general history of the settlement at 'Ain Ghazal has been treated elsewhere (e.g., Rollefson and Kohler-Rollefson 1989; Rollefson et al. 1992; Simmons et al., 1988) and will not be repeated here. Past publications have also described some of the ritual material from the site (e.g.,Rollefson 1983, 1986; Simmons et al. 1990), but little attention has been paid so far to the implications such material has on 'AinGhazal's social organization and how it changed over the two millennia of the town's growth and decline. MPPNB deposits were sampled over approximately 200 m2 during the 19821985 seasons. 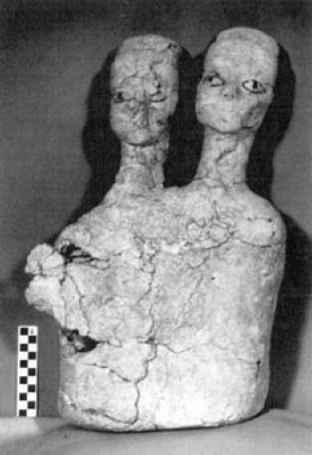 In addition to the more mundane archaeological remains were numerous clay human and animal figurines, subfloor and courtyard burials, caches of skulls (untreated, painted, or plastered), and ceremonial "burials"of large human statuary made of lime plaster. To date more than 150 clay animal figurines have been recovered from MPPNB deposits, 60% of which were unidentifiable. 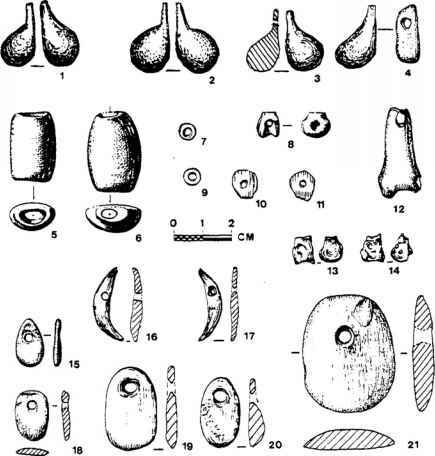 Of the remainder, more than 90% (fifty-six of sixty-one) were cattle (including a cache of twenty-three in a trash deposit); several were anatomically identifiable as bulls (Rollefson et al. 1985: 87). Notably, cattle bones from the MPPNB show no clear morphological indication of domestication, although pathologies on some Bos phalanges suggest some calves may have been tamed and reared in captivity (cf. Rollefson et al. 1984). How many of these animal figurines may have been "toys"cannot be determined, although the posture of the dog (Rollefson 1983:Pl. III-7) and perhaps both goat specimens probably fit this usage. 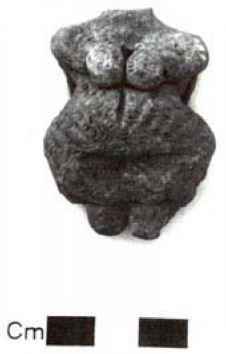 Several clay cattle figurines bore thread impressions around the neck, which can be taken to support the taming hypothesis of these animals. 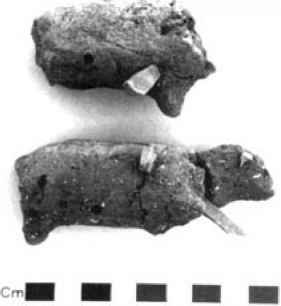 Two bovine figurines received special treatment: after each was ritu-ally "killed"with flint bladelets while the clay was still wet, both were fired and then placed side by side in a pit beneath the floor of a house (Figure 2). Certainly these pieces were not toys, but instead they were used in some solemn ritual, perhaps for luck or magic in the hunt. full term and finally gave birth to a child. Although the sample is too small to be statisticallyvalid, among the 'Ain Ghazal mortuary population there is a perceptible and unexpected increase in the death rate for females at ca. age 14-15, possibly associated with first birthing experiences. If a child is stillborn or dies shortly afterbirth, it is a sad event, but another child can be produced within the next year. If the mother dies during birth, this is a major loss of social investment in future generations. A total of 81 human interments came from MPPNB contexts. As was the case for Beidha (Byrd 1994:657;Kirkbride 1967:9),the number of burials at 'Ain Ghazal is much too low to represent the general pattern of postmortem treatment. For example, the eight people (or twelve, if the two groups of skulls are included) beneath one house represent a span of approximately 400 years (the use-life of the structure), or one burial every thirty-three to fifty years. Even if all of the burials are considered (eighty-one over the MPPNB span of 750 years), the apparent "death rate" is one burial every nine years. The great majority of the dead were obviously disposed of elsewhere, and most of the bodies recovered in the excavations represent particular individuals selected for special treatment. 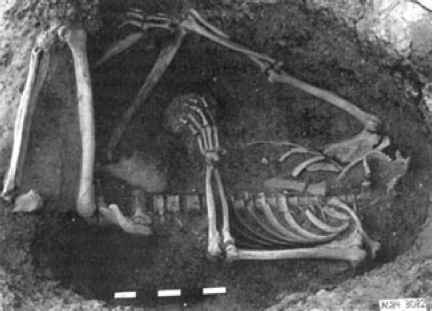 Three burial "styles" occurred during the MPPNB: (1) subfloor and courtyard, decapitated; (2) courtyard, skull intact; and (3) infant (Rollefson 198650). The differences, aside from the presence or absence of the skull, between the first two styles indicate a clear differentiation in status. In the first case, burials placed beneath house floors (Figure 4) entailed an expense in terms of labor to resurface the floors with lime plaster (cf. Rollefson 1990a) after the removal of the skull. The individuals were placed in the pit in a loosely flexed position, and the fill of the pit was invariably free of any trash; grave goods were very rare. In contrast, individuals in the second "style" appear to have simply been discarded into holes dug into trash deposits, and some people were literally stuffed into small, shallow pits and covered with the debris-laden backdirt. These "trash burials" account for about one-quarter of the noninfant mortuary population. be taken to reflect an ascribed status enjoyed by the older subfloor individuals. The disposition of the twelve MPPNB skulls removed from subfloor burials varied in several ways. In one case, a cache of three skulls was placed in a separate subfloor pit beneath the same room as six decapitated burials; all three skulls faced the same direction (east), but otherwise there was no evidence of any additional special treatment (Rollefson 1986:50, Pl. II-6). In an adjacent room of the same house, a reflooring episode had removed all but the rear areas of an apparently forgotten skull buried beneath the floor. While nothing can be said of the face, the back of the skull was covered with a thick coat of a black substance, possibly bitumen. 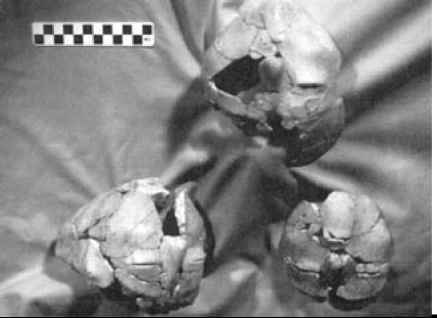 Three temporal and parietal fragments of a shattered skull were found on the floor of another house that appears to have been destroyed by fire. All pieces bore clear evidence of red pigmentation, but since so little of the skull was found nothing can be said of any facial treatment. Its context suggests that the skull had been "on exhibit" before it fell to the floor. A cache of four skulls was buried in a courtyard accompanied by two infant burials placed above them. Two of the skulls retained small patches ofplaster and bitumen "eyeliner" decoration (Rollefson 1983:35, Pl. IV-1,2). Since the missing plaster was not found in the pit, it is clear that the fragmentation had taken place elsewhere and was not repaired; instead, the group was disposed of ceremonially, possibly replaced by more recent plastered skulls. Another plastered skull, much better preserved and bearing no evidence offacial "cosmetics," comes from an unclear context, although the absence of any nearby architecture indicates it was buried in a courtyard pit (Simmons et al. 1990). Finally, a courtyard pit dug into sterile clay contained the broken (but essentially complete) remains of three plastered "skulls"(Griffin et al., 1998; cf. Rollefson 1986:45-46, Pl. 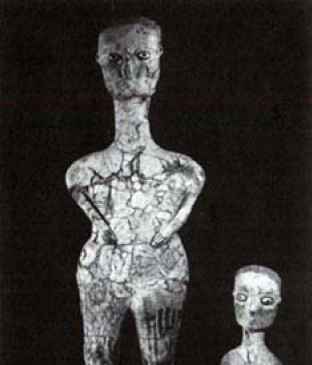 I-1 mistakenly identifying the material as a single statue head). The skulls themselves were not present, but bone impressions on the interior surface of the fragments prove that the plaster originally coated crania that were clearly disposed of elsewhere (Figure 5). Dated to older than 9,100 bp, these pieces are the oldest known evidence of plastered skulls. that both males and females are represented, and it is likely that children are depicted; at least two statues can be interpreted as being associated with birth or fertility. The smaller busts (35-45 cm) share facial details with the statues, including bitumen eyeliners dusted with a green crystal powder. The two sizes (Figure 6) suggest that at least a two-tiered hierarchy is represented. Features of the feet of the statues clearly show that they were anchored through a floor at one time, and it can be assumed that the statuary was on display, at least on special occasions. The cache excavated in 1985 is younger (ca. 8,500 bp), perhaps dating to the transition between the MPPNB and LPPNB. All of the material has been conserved and restored at the Smithsonian (Grissom personal communication), and it is clear that at least three of the statues possessed two heads facing in the same direction (Figure 7) (Grissom n.d.). tions have been rare so far, and as a consequence human burials number only seven; in all but one case they resemble the MPPNB styles. The exception to the burial mode is the first example at 'Ain Ghazal of a secondary burial: a fifteen-year old young woman whose bones were stacked alongside her skull. Ofthe two LPPNB "trash burials," one shows evidence of a violent cause of death: a flint bladelet (snapped at both ends) penetrated the left side of the skull with such force that a 3-cm-diameter piece of the inner wall of the cranium was jammed into the brain. Many of the bones of this individual were also broken, but it has not been determined if this was due to postdepositional disturbance of the burial pit. Human and animal figurines have been relatively rare, and there is little reason to comment on them. Plastered skulls have not been found so far, nor has any plaster statuary been recovered (although the 1985 cache may be from the earliest part of the LPPNB). It is possible that sampling error may be responsible in these cases. The identification and interpretation of structures associated with ritual practices is not a straightforward task (Renfrew 1985:1). Nevertheless, when floor plans, structural features, and decorative elements are taken into account, some buildings at 'Ain Ghazal are clearly nondomestic and probably served some ritual function. Three kinds of ritual structures have been identified so far at 'Ain Ghazal. The first kind is an apsidal building, and so far three (and perhaps four) of these constructions have been found over the 500-year LPPNB period at the site: one in the Central Field (once considered to be a Yarmukian "public building") (Rollefson et al. 1990:110-111), one and possibly two in the North Field, and another in the East Field (Kafafi and Rollefson 1994;Rollefson and Kafafi 1994, 1996). Their small size (ca. 10 m2 floor area) and geometric singularity contrast sharply with the contemporaneous domestic architecture (cf. 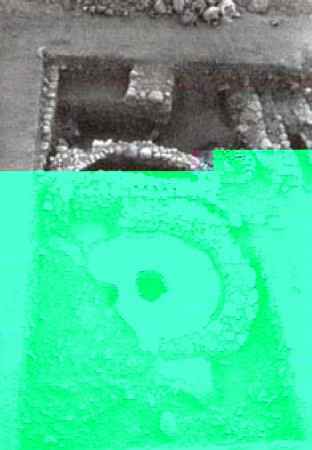 Rollefson 1997), and the overall similarity with the shrine found by Kenyon at Jericho (Kenyon 1981:307) supports a ritual use at 'Ain Ghazal. The second kind of LPPNB ritual structure may simply be an evolutionary development from the apsidal form. Arguments for this interpretation come from a building that underwent four construction phases: the first two included apses at one end (at least), the third phase closed off a collapsing apse, and the fourth phase witnessed the construction of a circular room with a small antechamber to the east (Kafafi and Rollefson 1994; Rollefson and Kafafi 1994, 1996). 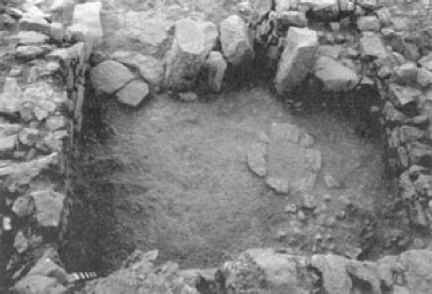 The small circular room (2.5 m diameter), with a relatively large hearth/altar installation inside it (Figure 8), was evidently the locus of cult activities. There were eight flooring episodes directly atop each other, each painted red; this cycle of renewing the room's floor would have been very expensive in terms of labor and time (cf. Rollefson 1990a) and suggests that the resurfacing coincided with some special events. The circular shrine or cult building appears to have been badly damaged by subsidence: three immense cracks in the floor might reflect structural damage that caused its abandonment. Just 4 m to the south and at the same level, an identical circular building was constructed, evidently hastily, to replace the unusable shrine to the north. The walls of the replacement structure were made of small globular stones as opposed to more substantial flint and limestone blocks in the original circular building, and the two flooring episodes of the new building, although painted red, were thin and fragile and placed directly atop the underlying dirt instead of upon the normal foundation layer of a mixture of gravel and lime plaster. Clearly, this replacement building was not intended to last for an appreciable period of time (Rollefson and Kafafi 1997). eroded). The northern, eastern, and southern walls are preserved to a height of about 75 cm, and it is possible that they were never higher than this (see below). The interior arrangement of features suggests at least two phases of use and reorganization. had been burned so intensely and repeatedly that the upper 3-4 cm had been transformed into a ceramic slab; this may reflect an altar-like use. Between the central standing stone (which had fallen toward the downhill side at abandonment) and the eastern wall was a floor hearth of red-painted lime plaster surrounded by seven flat limestone slabs. In the eastern wall was a doorway roughly a meter wide that led uphill. The floor of the structure was unlike any other LPPNB building excavated at 'Ain Ghazal: it was made of plain dirt, with no use of lime plaster at all. In a later phase, the doorway in the eastern wall was closed with the use of dressed limestone blocks and, in particular, an orthostat of dazzling white limestone shaped to an oval cross section. The top of the orthostat was unfortunately encrusted with a layer of calcretion, so it could not be determined if the central hump was the result of intentional shaping. Even so,the orthostat has an anthropomorphic shape, albeit highly stylized. There is no evidence of the use of pigments anywhere on this feature. The top of the orthostat rises about 10 cm above the walls, which suggests that the enclosure may have been open to the sky, at least during this phase. Another change in the internal arrangement of the LPPNB temple/sanctuary consists of a low platform built inside a thin wall between the north ernmost standing stone and the north wall. This alteration, in addition to the presence ofthe floor "altar" along the southern wall, effectively created two rooms in the temple, with the only passage from the western room to the eastern through the narrow spaces between the standing stones. It is not clear if this modification of the building coincided with the blocking of the eastern doorway.